Within the framework of exhibition Ground Truth: Testimonies of Destruction and Return in Al-Araqib, CPS is holding a scholarly panel to expand the discourse on the origins of the dispossession, expulsion, and displacement of the Palestinian Bedouins in the Negev/Al-Naqab, and in particular its historical background and legal aspects. 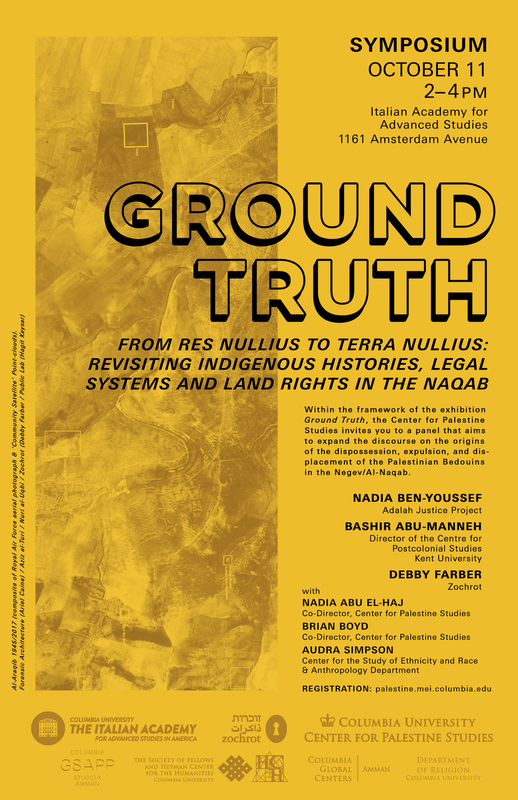 The panelists are scholars and activists involved in historical research, legal geography, and human rights with the aim of situating the case of the Naqab Bedouins within key international debates, such as the territorial dispossession of indigenous peoples, indivisibility, and interrelationship of socioeconomic, cultural, civil, and political rights. Nadia Ben-Youssef is the co-founder and director of Adalah Justice Project (AJP), and works at the intersection of law, advocacy, and art to advance human rights. Prior to leading AJP, she worked with Adalah - The Legal Center for Arab Minority Rights in Israel (Adalah) both in Israel/Palestine and in the US. She coordinated Adalah's international advocacy on behalf of the indigenous Palestinian Bedouin community in the Naqab, and most recently served as the organization's first USA Representative. As an outgrowth of her work in the US, AJP was launched in February 2017 to influence American policy and practice in Israel/Palestine. Much of the work of AJP has focused on building a transnational movement against supremacy and state-sanctioned violence together with cause lawyers, community organizers, and artists across diverse movements for social justice. Nadia is a member of the New York State Bar, and holds a BA in Sociology from Princeton University, and a J.D. from Boston College Law School. Bashir Abu-Manneh is Reader in Postcolonial Literature and Director of the Centre for Postcolonial Studies at the University of Kent in the UK, and author of The Palestinian Novel: From 1948 to the Present (2016) and Fiction of the New Statesman, 1913-1939 (2011). His edited book on Edward Said as critic and theorist, After Said: Postcolonial Literary Studies in the Twenty-First Century, is out at the end of the year. Debby Farber is the curator of Zochrot NGO ("Remembering" in Hebrew), an Israeli organization working to promote acknowledgement and accountability for the ongoing injustices of the Nakba, the Palestinian catastrophe of 1948. Between 2012 to 2014 she served as the Civil Transitional Justice program director in Zochrot where she established the first Unofficial Truth Commission in Israel for the events of 1948 in the Negev. Debby is a former AHDA fellow of the Institute for the Study for Human Rights at Columbia University and is currently also a PhD Candidate in the Politics and Government Department in Ben Gurion University where she explores the linkages between Visual Culture, History and Political Geography within the visual historiography of Israel/Palestine.